Five-time world champion Ronnie O'Sullivan says he no longer has any interest in being snooker's "top man" but has not retired. The 39-year-old Englishman has not played in a competitive match since the World Championship quarter-finals in April, and has not entered next week's UK Snooker Championship. "I do want a place within the sport, and I'm trying to fathom what that place is," he told Eurosport. 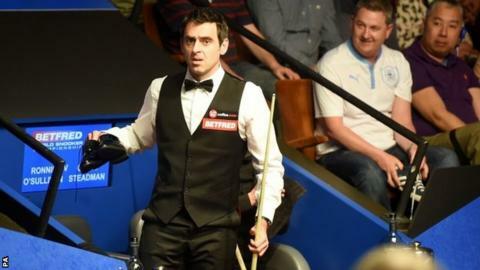 O'Sullivan also opted not to defend his title at last week's Champion of Champions in Coventry, which Neil Robertson won. He is currently playing exhibition matches. "It's been tough at times but I truly feel I have a good idea of what it is I want," he said. "I don't want the pressure of being the top man in snooker any more. I feel that should be left to the new generation of players. "It's funny really. I'm actually enjoying my practice more then ever. I play for fun now. I still try to be the best I can be, but I don't have to be so serious about being so committed to it. "Me and my mates play a lot these days."